A couple Toronto startups are trying to make art accessible—if they can stay afloat in an expensive city. 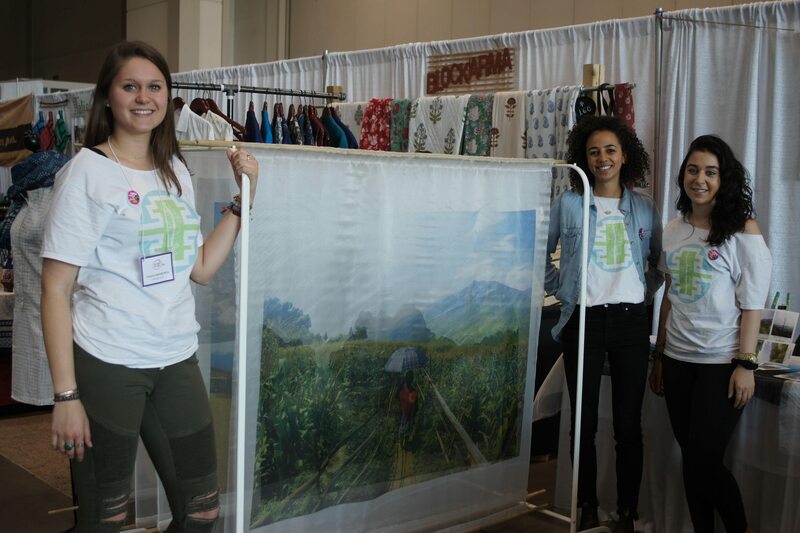 Wandervoic founder and co-founder Anna Afshar and Ivanna Hreshchuk stand with communications director Samantha Preddie at the Buy Good Feel Good Expo on May 14. Photo by Yasmine Laasraoui. In an economic environment where young people are caught between part-time work options and earning cash on the side through “gigs,” some Canadians are pushing back and following their passion: art. Torontonians behind the companies Partial and Wandervoic, two art-based startups, are working against the grain to fulfill their mission of bringing art to the people. “Art is seen as this super niche, elitist thing, and it’s definitely not. Accessibility is challenging,” explains Tammy Yiu, co-founder of Partial, an online platform where Canadians can rent art produced by artists in their community. Wandervoic sells ethically sourced phone cases and tapestries showcasing what Hreshchuk calls a “visual voice” from her travels. A portion of the proceeds Wandervoic makes go to a local NGO. But in a tough economic landscape, funding your own startup while still making ends meet in the 13th-least-affordable city in the world, isn’t easy. Partial and Wandervoic’s founders have employment outside of their startups to ensure personal financial stability. “We’ve been bootstrapping it ourselves,” Yiu says speaking about her and her business partner, Chris Kim who does all the web development. Partial doesn’t sell an actual product, but instead facilitates the transaction between artists and art owners, so there is not a fixed cost. Contrary to Partial’s rental model, Wandervoic does need funding for upfront costs including travel, materials, and phone cases. Afshar took a stance against angel investors. “We want thoughtful and empathetic people, we are trying to tell people a story,” she said. Wandervoic aims to fund their art by finding these individuals through a Kickstarter campaign. 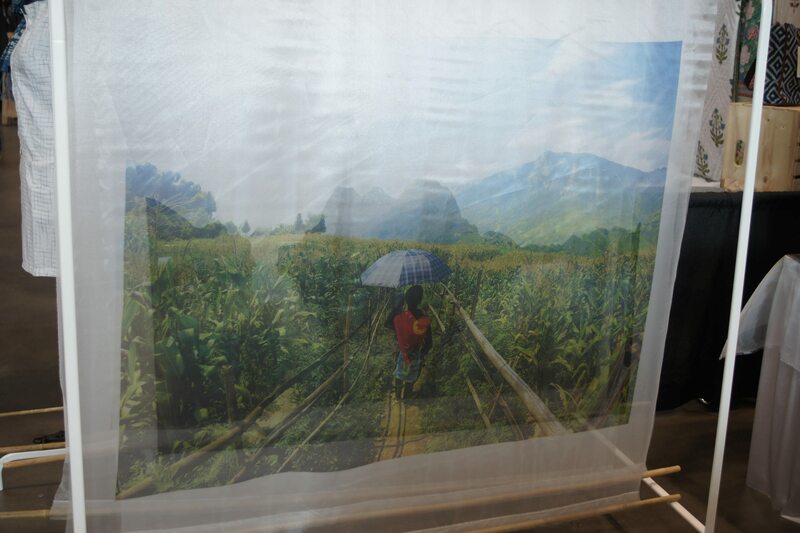 Wandervoic’s trade show booth at the Buy Good Feel Good Expo on May 14 showcased their organza tapestry featuring original photography from Vietnam. Photo by Yasmine Laasraoui. Funding isn’t the only obstacle startups face in their early years. Owners also need to think about converting potential customers and suppliers. Many people appreciate art, but does the average Joe put enough value in artwork to pull out their credit card? Companies face a similar challenge with suppliers. It’s difficult to find a company that’s willing to work with significantly smaller orders than they’re accustomed to. Finding the right supplier, one that is willing to see your business grow, is key. “I need to focus more on the education of it, to really sell the idea,” Yiu says about Partial’s difficulties. Cities like Toronto are home to many business incubators that can help entrepreneurs looking to launch their startup by connecting them to coaching, financial resources, and a community of innovators. With over 60 incubators and accelerators in the city, the startup ecosystem has boomed to between 2,500 and 4,100 active startups, according to a report by TechToronto. Abdullah Snobar, executive director of the DMZ at Ryerson University, one of Canada’s largest tech-startup incubators, highlights that the “soft skills” of an entrepreneur are needed to successfully grow your startup. These skills include everything from “engaging your audience with a compelling pitch to having the empathy to understand your potential customers,” Snobar advises. Despite the many challenges that startups can face in their infancy, “it’s all about how you get through and around [them],” he adds. Partial and Wandervoic’s founders can attest to Snobar’s statement. Overcoming adversity is essential to forming your idea into a viable business idea. Getting hung up on the details at the beginning hinders development and could be costly, especially when it’s on your own dime. Toronto has a wealth of resources, and connections can help grow a business. “Try to say yes as much as possible,” Afshar says. The global recognition of talent is also aiding in the so-called “boom” of startups in Toronto. “Talent and skill have no borders,” the DMZ’s Snobar says. Canada’s rich and diverse communities form the backbone of the startup community and, for Partial and Wandervoic, that can make or break success.